This was for the 100th issue of G-Fan. 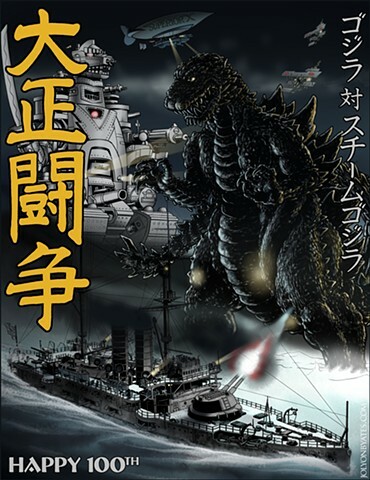 I thought it would be fun to treat is as the centenary edition, and design a poster depicting the Godzilla of 1912. The vessel is The Mikasa, Japan's flagship of The Russo-Japanese War. The text is TAISHO FIGHT GODZILLA vs STEAM GODZILLA. Steam Godzilla is a retro version of Mecha Godzilla, naturally. G-Fan 100 features artwork by Bob Eggleton and a cover by Matt Frank.